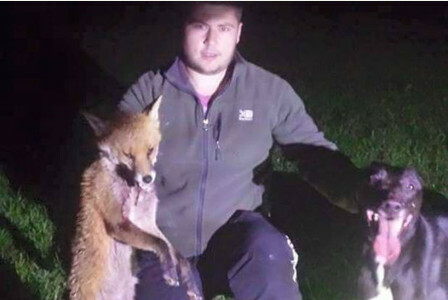 THREE men allegedly connected to a hunt have been convicted of illegal hunting after being caught driving through the countryside in the middle of the night with scarred terriers and a live fox in a bag. One of the three who were found guilty and fined is a serving soldier in Wiltshire, and now faces disciplinary action from his superiors. 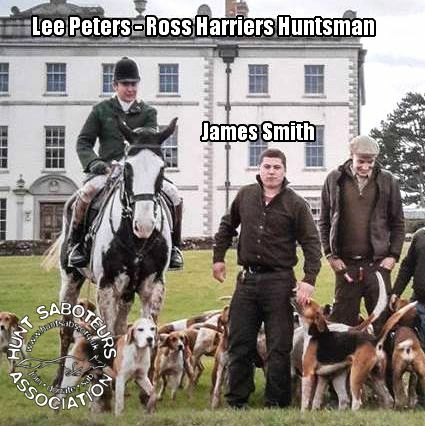 The Ross Harriers Hunt said they were ‘adamant’ the trio were not connected with them. Magistrates in Hereford heard that police stopped a vehicle being driven through the Herefordshire countryside in the middle of the night in October last year because the trailer it was pulling had no lights working. They were suspicious when Alan Hill, 54, got out of the vehicle, grabbed a bag from the trailer and ran off into the night. A police officer gave chase, caught Hill, who is known as Dylan Hill, and was astonished to discover the bag contained a live fox. 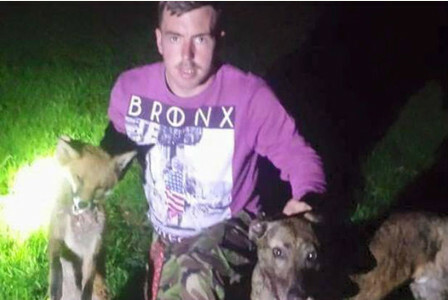 Back in the trailer, and the vehicle, there were three dogs with facial scarring, that animal welfare campaigners said were consistent with being previously involved in attacking foxes. Two younger men were with Hill at the time: James Smith, 22, and 21-year-old Jack Hudd, a soldier based in Wiltshire. The three were arrested and when questioned claimed they had written permission to do what they were doing but did not have it with them at the time. “This piece of information was to be the key to their successful prosecution as the Hunting Act 2004 states that those legally hunting in such circumstances must have written permission on their person,” said a spokesman for the RSPCA. “The fox, which was still very much alive, had a very lucky escape as police released the animal back into the wild that evening. It is still not known what Mr Hill was intending on doing with the live fox once they had reached their destination,” he added. A spokesman for the army confirmed that Private Hudd is a serving soldier with the Royal Logistics Corps, based at Buckley Barracks in Hullavington, near Chippenham in Wiltshire. The case, which was handed by police to the RSPCA to bring as a private prosecution, last night sparked a furious row between hunt campaigners and anti-hunt activists over who the men were and what they were doing. 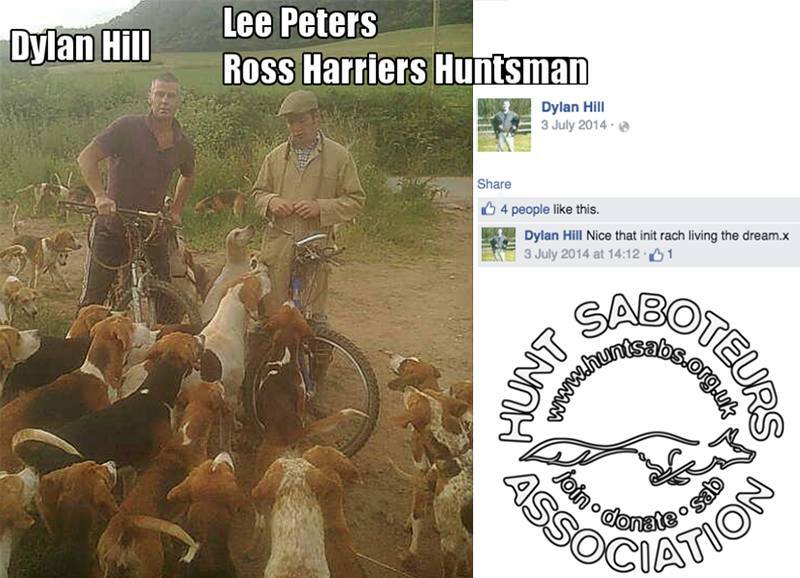 While the RSPCA did not link the three to any organised hunt, the Hunt Saboteurs Association published evidence in the form of Facebook posts and pictures by and of the men themselves, which apparently showed they were linked to the Ross Harriers Hunt, which operates in south Herefordshire, Monmouthshire and the edge of Gloucestershire. 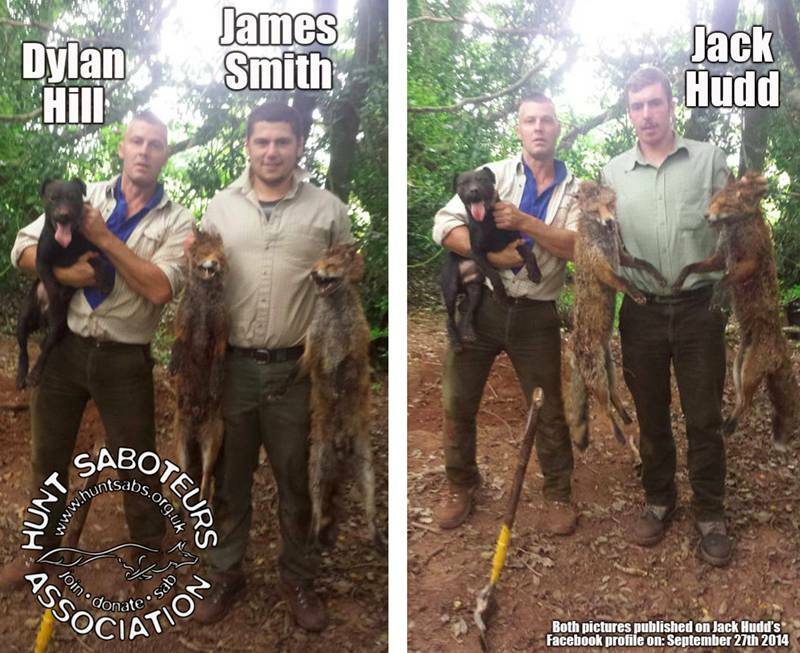 The HSA claimed the men, when caught last October, would have been training their terriers to kill foxes using live foxes – which is how their dogs got their injuries. All three defendants were convicted of one offence of hunting contrary to the Hunting Act 2004. Hill was also convicted under animal welfare laws of one offence of failing to take reasonable steps to protect the fox which he had captured and had kept in a rucksack. RSPCA director David Bowles said the successful prosecution showed the Hunting Act did work – but pointed out that the trio were convicted because they did not have written permission from a landowner, and because they had three dogs – both requirements that would have been swept away by the Government’s proposed amendments that were not put to a vote this week. If they had a letter, or only two dogs with them, they would have not broken the law. “The Hunting Act in its current form clearly does work as we successfully prosecuted three men in Herefordshire for breaking the law,” he said. “If the law is changed including removing the requirement for hunters to have written permission then it is sadly going to be a near impossible job to prove that individuals like these terrier men have broken the law. It will be a devastating blow to animal welfare in this country,” he added. Another row erupted this week following the conviction of the three. The RSPCA also prosecuted the three on animal welfare charges relating to the scar injuries previously suffered by the dogs they had. But the prosecution failed, so no order was made to keep or destroy the three dogs that were seized. They are understood to be due to be returned today (THU) to the men. An online petition demanding the dogs – who now number eight after one of the three had puppies while it was being cared for by a local vet – has already garnered thousands of signatures. WG notes: Additional photos from the HSA – please support their work!